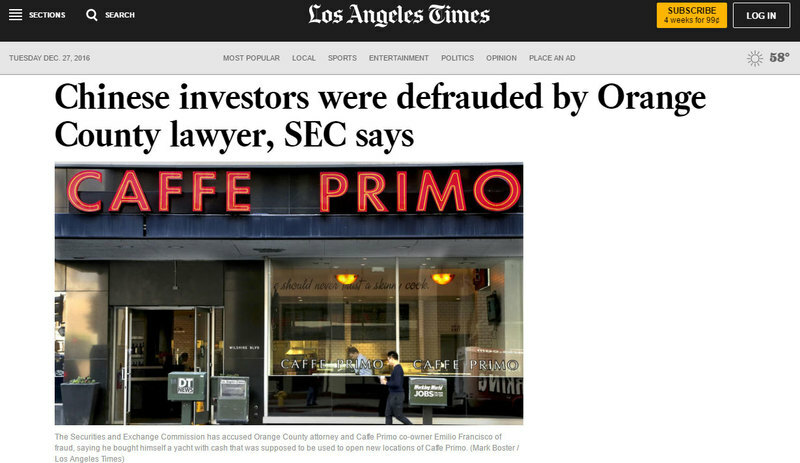 The Securities and Exchange Commission has accused Orange County attorney and Caffe Primo co-owner Emilio Francisco of fraud, saying he bought himself a yacht with cash that was supposed to be used to open new locations of Caffe Primo. Instead of using Chinese investors’ cash to open coffee shops, assisted living facilities and other businesses, an Orange County attorney spent millions on a yacht and other personal expenses, according to a civil fraud suit filed Tuesday by the Securities and Exchange Commission. The SEC alleges that Newport Beach lawyer Emilio Francisco misspent at least $9.5 million from 131 investors who wanted to participate in the federal EB-5 visa program, which promises permanent U.S. residency in exchange for investments that create jobs in the U.S. The program has faced harsh criticism over the last few years as developers stretched rules aimed at ensuring that EB-5 money flows to rural communities or areas with high unemployment. A disproportionate amount of investors’ cash has gone to build pricey condos and hotels in Los Angeles and other cities.